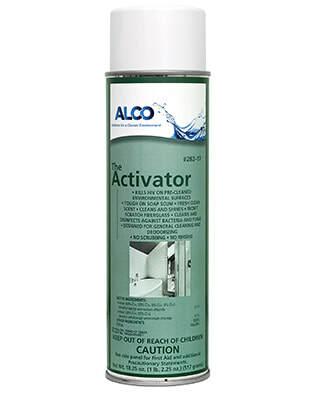 Alco Activator - Alco-Chem, Inc.
Germicidal, multipurpose foaming disinfectant deodorant. A quaternary ammonia based foam that disinfects and deodorizes as it cleans. Lemon scented. Cleans away and inhibits mold, fungus, and mildew growth. Kills Staph, salmonella, Pseudomonus and Herpes Simplex Virus types 1 & 2.